You're Invited to Carter Cutlery's Ribbon Cutting Ceremony! Friday, January 12th, 2018 9:30 am - 10:30 am 2038 NW Aloclek Drive Suite 225 Hillsboro, OR 97124 503-466-1331 Join the Carter Cutlery Team along with the Mayor of Hillsboro, Steve Callaway and members of the Hillsboro Chamber of Commerce as we celebrate our expanded space with our Ribbon Cutting Ceremony! Join us for an exciting Open House! If you're a local Oregonian or just visiting our awesome state, come and check out the exciting nature of bladesmithing! Whether it is forge welding damascus or forging a neck knife, we guarantee you'll learn something new every time! Join Murray and the Carter Cutlery team at the OKCA Knife Show. Join Murray and the Muteki bladesmiths and buy some knives! Come out and experience the world's largest knife show and ultimate blade experience. Murray and his Muteki bladesmiths will be on-hand to talk to you about their latest knife creations! Murray will be giving a shaving demo during this two-day event! Carter Cutlery will be on hand along with chefs and restaurants at this fun event! Knives and sake! It will be a great night! 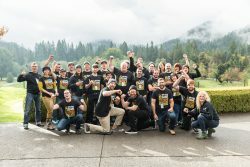 Carter Cutlery is the title sponsor of the Wild About Game event where a fierce competitive game cooking competition between some of Portland and Seattle's best chefs square off and the winner walks off with a Jewel Damascus knife forged by Murray! If you missed Carter Cutlery in Atlanta, then come out to Portland, OR and check out the latest in high performance kitchen knives. Murray will also be doing a shaving demonstration at this event along with scheduled trips to the forge to watch Murray in action! Join us for an exciting Open House! 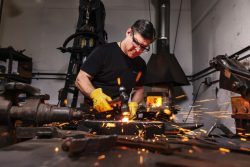 If you're a local Oregonian or just visiting our awesome state, come and check out the exciting nature of bladesmithing! Whether it be forge welding damascus or forging a neck knife, we guarantee you'll learn something new every time!